The RASopathies are a group of rare genetic conditions caused by mutations in genes of the Ras-MAPK pathway. Abnormalities of this pathway have profound effects on development and can cause one of several different syndromes, including: Cardio-Facio-Cutaneous (CFC), Costello (CS), Legius (LS), Neurofibromatosis type 1 (NF1), Noonan (NS, and Noonan with Multiple Lentigines (NSML, formerly called LEOPARD syndrome). These syndromes share many clinical features such as distinct facial features, developmental delays, cardiac defects, growth delays, neurologic issues, and gastrointestinal difficulties. While these individual syndromes are rare, as a group, the RASopathies are among the most common genetic conditions in the world. This chart is provided as a guide. 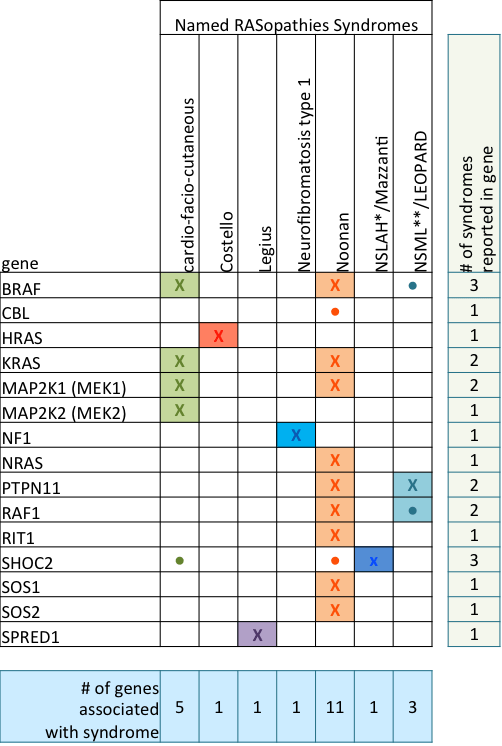 The relationship between clinical and molecular (gene) diagnosis is not hard-set, so someone who has features more like one syndrome but with a gene usually associated with another syndrome is possible. For some affected people, the diagnosis of RASopathy may be the best fit. We will work to keep this up to date as genes associated with RASopathies continue to be discovered. X in a box = a strong match between the gene and the syndrome. ● in a box = people have been identified to look more like this syndrome (phenotype), though the gene is more commonly linked to a different syndrome (genotype).